We’ve recently learned of two upcoming events that feature the experience of police, policing, and incarceration — the first dramatized in a one-man theatrical performance, the second a documentary debuting at the DOC NYC Film Festival. 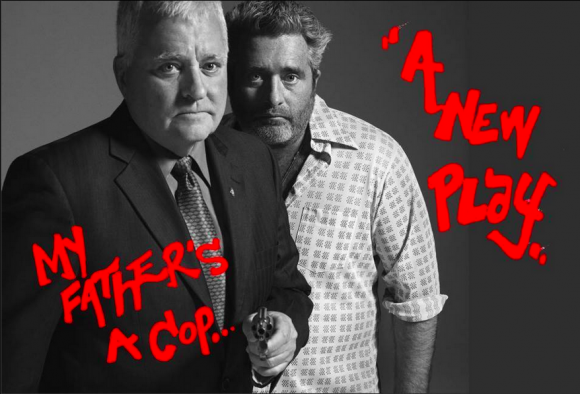 My Father’s a Cop is a one-man play based on the true story of a young man’s experiences as the son of a police officer and also of being incarcerated. Tickets: $15 — call 212 858 4444 or visit Under St. Marks to purchase tickets online. Patrolman P, a feature length documentary directed and produced by Ido Mizrahy, follows the tale of Bill Phillips, a former NYPD cop who spent more than three decades in prison for a controversial homicide conviction. The film reopens a controversial case from the 1970s era of corruption scandals in the New York Police Department. Investigators leaned on a flamboyant detective named Bill Phillips who, after being caught taking bribes from an infamous madam, agreed to go undercover. Phillips secured the indictments of dozens of cops, shattering the Blue Wall of Silence. But then he was charged with a crime that put him behind bars for three decades. Was it a conspiracy? The film is debuting at DOC NYC film festival. Tickets to opening night (November 16th) and our second screening later in the week (November 21) are for sale here. GC students – want to see one of these for free? The Prison Studies Group will buy your ticket (and a +1), if you are the first to email us from: prisonstudiesgroup@gmail.com. If you see the show or the documentary, consider writing a review for the blog!